This is an update from Scott M. Graffius, Founder and CEO of Exceptional PPM and PMO Solutions™. 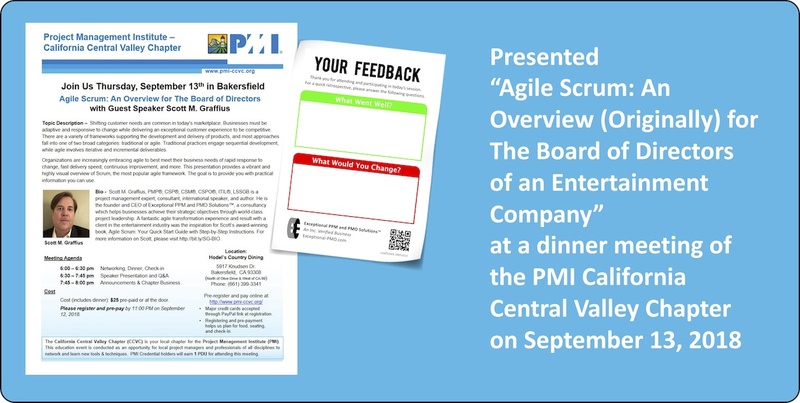 I had the honor of speaking on agile project management at a dinner meeting of the Project Management Institute - California Central Valley Chapter (PMI-CCVC) in Bakersfield last night. The presentation provided a highly visual overview of Scrum — including the roles, responsibilities, tools, and techniques unique to the framework — with a focus on best practices and top factors typical in successful implementations. Thank you to Fred Valenzano for the invitation and thank you to all of the PMI-CCVC members who attended the session. I enjoyed meeting and talking with everyone. The feedback was fantastic. For those not at the event: an example of a sticky note used to collect comments at the end of the meeting is shown (the example is a blank one — not filled out — for privacy). It's excellent to know "What Went Well?" Potential improvements, however, typically come from the other question: "What Would You Change?" (Additionally, attendees can provide feedback via an online survey.) All of the feedback is important, appreciated, and valued.